Total refined product stocks at the UAE port of Fujairah stood at 16.952 million barrels in the week to December 25, edging up 2% or 326,000 barrels from the previous week, according to data from the Fujairah Energy Data Committee, or FEDCom. This was largely on the back of a significant increase in middle distillates, rising by almost a third to 1.882 million barrels, S&P Global Platts Analytics said in a report. 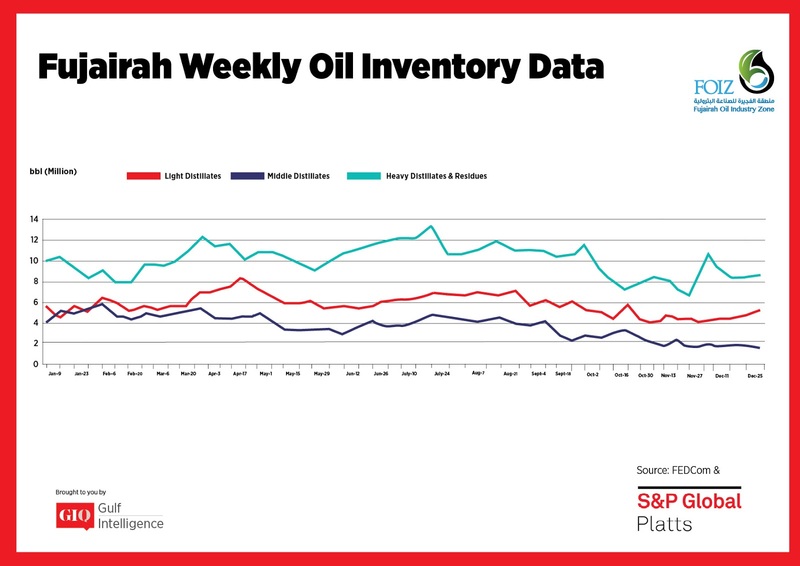 Despite stocks of middle distillates rising 30.7% to a seven-week high, they are still well below the year-to-date-average of 3.268 million barrels. The increase was due to a vessel originating from the West Coast of India. Bahrain Petroleum Co. has offered up to 60,000 mt of jet fuel for December 30-January 2 loading from Sitra. 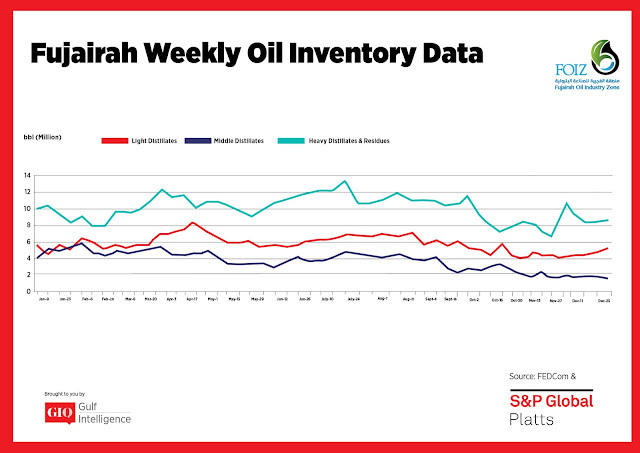 At the same time, stocks of light distillates dropped 3.7% to 4.783 million barrels, with the Middle East continuing to see strong demand, which is expected to continue well into Q1 2018. The region is currently undergoing some refinery maintenance, including Qatar Petroleum's 137,000 b/d Mesaieed refinery and Saudi Aramco's 550,000 b/d Ras Tanura splitter. Stocks of heavy distillates and residues increased slightly by 0.7% or 70,000 barrels to 10.287 million barrels. Frontrunners are emerging to supply Pakistan’s State Oil’s tender for its February fuel oil requirements, for both high and low sulfur cargoes. For its 60,000 mt cargo of 120 CST LSFO with maximum 0.95% sulfur for February 1-15, the frontrunner appears to be Vitol with a premium of around $67-$69/mt to the Mean of Platts Arab Gulf 180 CST HSFO assessments, CFR, sources said. This requirement is half PSO's usual requirement of two cargoes/month of LSFO. For its two 65,000 mt cargoes of 125 CST HSFO with maximum 3.5% sulfur -- below its usual seven cargoes/month -- the frontrunners appear to be Bakri and Gulf Petrochem with premiums of around $16-$17/mt to MOPAG 180 CST HSFO assessments, FOB basis, traders said. PSO's previous tender for January imports was canceled amid domestic oversupply and a shift towards cleaner fuels like LNG for power generation. The UAE's ADNOC is seeking a total of 1.57 million mt of 95 RON gasoline for 2018. ADNOC's 127,000 b/d RFCC at its Ruwais 2 refinery, which got damaged in a fire last January, is not expected to restart until 2019. 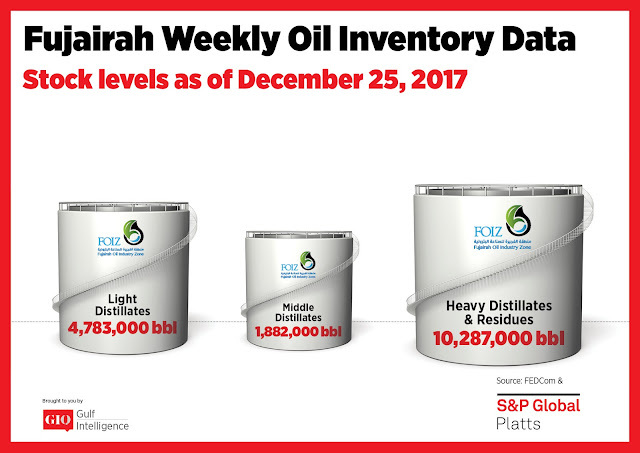 Stocks of heavy distillates and residues also inched up slightly by 0.7% to 10.287 million barrels.